Roy Larson had served in the pulpits of five United Methodist churches by the time he traded the title of “Rev.” for a byline in 1969. Both he and other editors at the Chicago Sun-Times had watched Rabbi Abraham Joshua Heschel and the Rev. Martin Luther King lead marches to advocate for civil rights and protest the Vietnam War. Religious communities weren't just confined to their sanctuaries. They were at the forefront of social revolution. Larson’s coverage was anything but deferential. 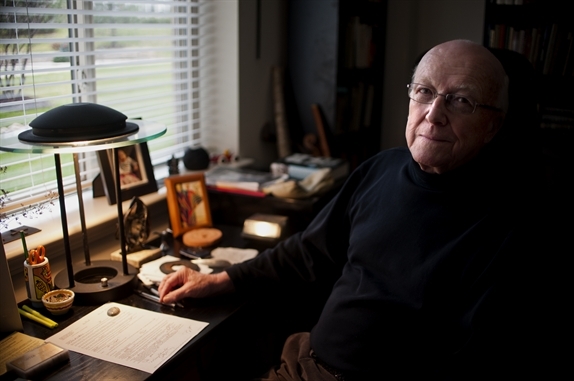 He is best known for the 1981 investigative series he launched against Chicago’s then-archbishop, Cardinal John Cody. The unprecedented series of stories by Larson and two other investigative reporters, William Clements and Gene Mustain, concluded an 18-month quest for evidence that Cody had diverted tax-exempt church funds for personal use. The allegations had sparked a federal grand jury probe. Years later, Larson established the Center for Religion and the News Media, a joint program sponsored by the Medill School of Journalism at Northwestern University and Garrett-Evangelical Theological Seminary. For his intrepid reporting and commitment to fostering a new generation of religion writers, Larson will receive the 2014 William A. Reed Lifetime Achievement Award at the Religion Newswriters Association’s annual meeting in September. Born and raised in Moline, Ill., Larson edited his high school's literary magazine and newspaper, Line O' Type. He received a bachelor’s degree in 1951 from Augustana College in Rock Island, Ill. and a master of divinity degree from Garrett-Evangelical, a Methodist seminary, in 1955. As a Methodist minister, Larson led five Chicago area congregations and, in 1968, became one of the youngest clergy delegates elected to the denomination’s General Convention. That following year, however, Larson turned in his clerical collar and joined the staff of the Chicago Sun-Times as religion editor and columnist. His nationally distributed columns won a National Headliner Award in 1974. One of his first assignments on the beat was covering a lecture by Pulitzer Prize-winning African-American poet Gwendolyn Brooks. Instead of writing solely about her lecture, Larson documented how a clergyman mistreated the Illinois Poet Laureate after mistaking her for the hat check girl. Radio personality Studs Terkel read the entire column on his show the next morning. That critical observation “was kind of a reflection of the way the beat was changing,” Larson said. More than a decade later, Larson trained that same critical eye on the Roman Catholic Archdiocese of Chicago. In 1982, Larson and two other reporters earned another National Headliner Award for outstanding investigative reporting for work on the Cardinal Cody series. "One of the things that I very strongly believe as a churchman is the New Testament thing: Judgment begins with the household of God,” Larson told fellow journalist John Conroy in 1987. As a reporter, Larson traveled to Israel, Rome, Kenya, South Africa, Mexico, Canada, Poland and seven other countries in Central America, covering papal visits by Pope John Paul II and papal transitions. Photographer and frequent travel companion John White said Larson always captured the heartbeat of the story. "The world was his pulpit," White said. Shortly after media mogul Rupert Murdoch purchased the Sun-Times in 1984, an editor insisted that the newspaper refer to Catholic leaders by their formal honorific titles. Disheartened by the notion that the paper would no longer treat religious leaders like other public figures, Larson moved on to become editor and publisher of The Chicago Reporter, a journal that specializes in investigative reporting on issues of race and poverty. In 1995, Larson persuaded a skeptical administration at Northwestern’s Medill School of Journalism that a joint program to train the next crop of religion reporters was not only necessary, but in high demand. He directed the program and taught courses in religion and journalism. With the Democratic National Convention on its way to Chicago in 1996, Larson invited the Religion Newswriters Association to hold their national meeting in north suburban Evanston that year. In a Sun-Times story about the conference, Larson explained how the media had devoted more extensive coverage to religion and ethics as a result of marketing research. Readers wanted more coverage of spiritual matters. In fact, some newspapers even launched free-standing religion sections, he said. “I’ve been saying God is hot,” he told the reporter at the time. The decline of mainline churches and lack of interest among young people signals the end of that era, said Larson, who has dabbled in church communications since he retired in 2002. “Secular culture has moved at a pace the religious culture couldn’t deal with very well,” Larson said. But that doesn’t mean the need for religion reporting has cooled. In fact, he looks forward to seeing how the next generation of religion writers explains this phenomenon and more. Roy Larson now lives in the west Chicago suburb of Naperville with his wife Dorothy. The couple has three children, seven grandchildren and six great-grandchildren with another on the way in July. A fourth son passed away in 2005. Manya Brachear Pashman covers religion at Larson's former competitor, the Chicago Tribune.